Welcome to our fleet of luxury watercraft. Here you will find everything from stylish and nimble speedboats to extravagantly luxurious superyachts. We have something for every occasion and for every budget. Simply scroll down the page and click ‘View Details’ for more information about each boat. 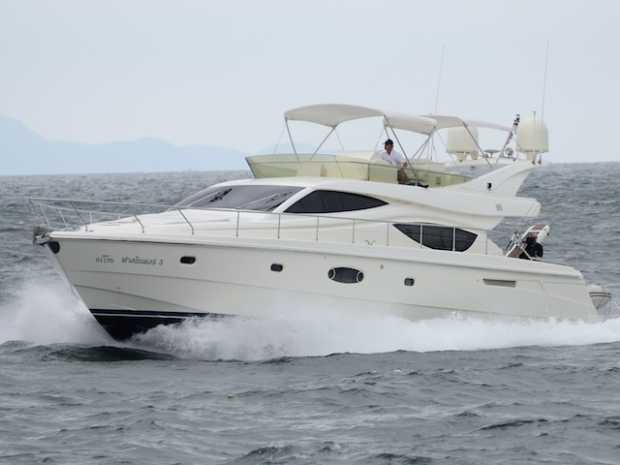 Pattaya Yacht Charters are pleased to introduce to you the fastest and most luxurious commercial speedboat available for private charter in Pattaya Thailand. 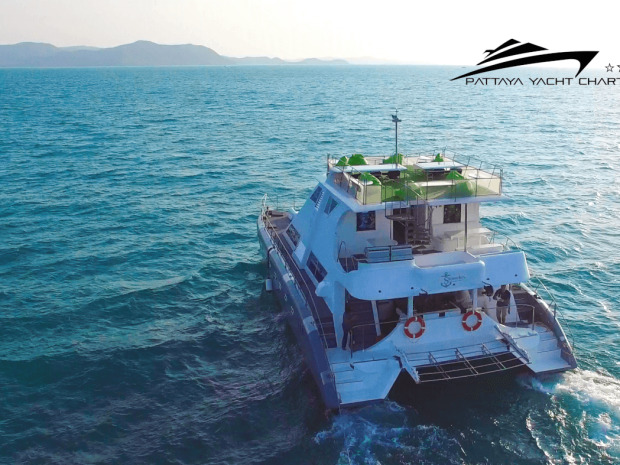 The speedboat is appropriately named ‘Archipelago Adventurer’ as she is the best vessel to discover the hidden island gems in the several islands that make up the Pattaya archipelago. Unlike our other slower vessels such as our motor yachts when chartering Archipelago Adventurer you can see and visit many more beaches and destinations in one day due to the incredible speed she travels at whilst cutting through the water. 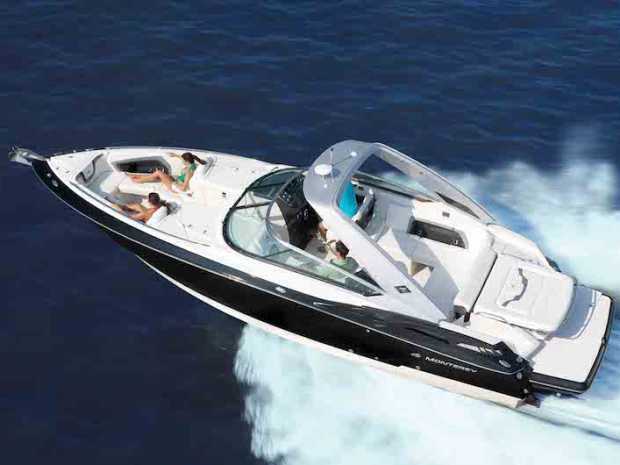 Powered by twin 300 HP Mercury Verado four stroke engines delivering a total of 600 HP she can reach a top speed in excess of 40 knots and comfortably cruises at 28 knots. AA is so fast that she opens up the horizons of further away destinations for a day charter such as the stunning Samaesan Archipelago. 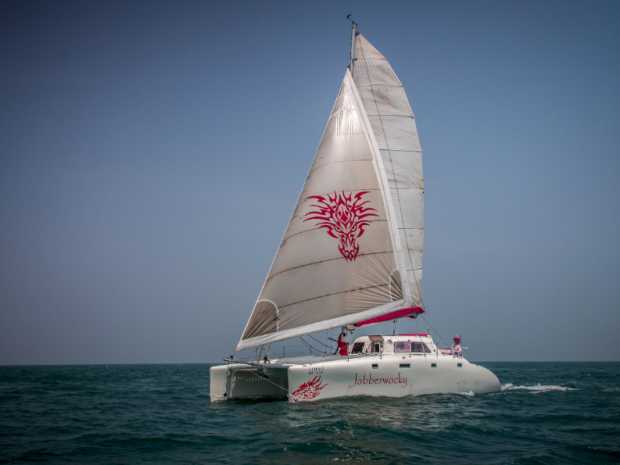 She can even cross the channel and reach Hua Hin in just 2 and a half hours. The magical island of Koh Samet is also achievable within this short time frame. 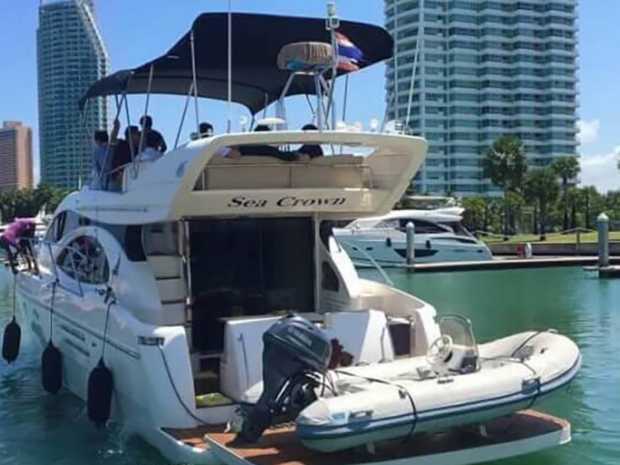 Built by Thailand’s leading boat manufacturer Seat Boat Co ., ltd she was delivered to Pattaya Yacht Charters brand new at a cost of 4 million Thai Baht in May 2016. She features incredibly comfortable wide leather sofa seats with cozy booth style seating arrangements that are so much better than the unfriendly standard speedboat seating arrangements found upon 99% of other commercial speedboat vessels. The large bathroom with electric marine toilet and sink encompases 6 foot headroom which is most welcomed by larger passengers.The rear transom freshwater shower is great to rinse the salt water off after your swim at your deserted island bay. The aft starboard oversized swim ladder is boarded by opening a door in the hull allowing very easy embarking and disembarking of the speedboat. This feature is also most welcomed by Scuba Divers and AA has the ability to carry up to 36 dive tanks stowed away in clever under seat compartments for those VIP Scuba Diving excursions. There is also a fantastic Fusion Marine sound system that is compatible with I pods, mobile phones and USB’s so please feel free to bring along your favourite tunes or enjoy our own large music collection upon the PYC IPod. Garmin GPS, marine radio and all the other gadgets you would expect from a luxury vessel are onboard. Archipelago Adventurer is the perfect vessel for small families up to large groups who want to travel in style and comfort whilst getting to the best spots fast so you can spend more time actually enjoying the idyllic destination rather than travelling to it. Infact upon Archipelago Adventurer you can enjoy more destinations in a four hour charter than you can in eight hours upon most of our other luxurious vessels. We are proud to present the ‘Oceanis 46’ built by Beneteau in France and represents classics sailing style purely constructed for blue water sailing. 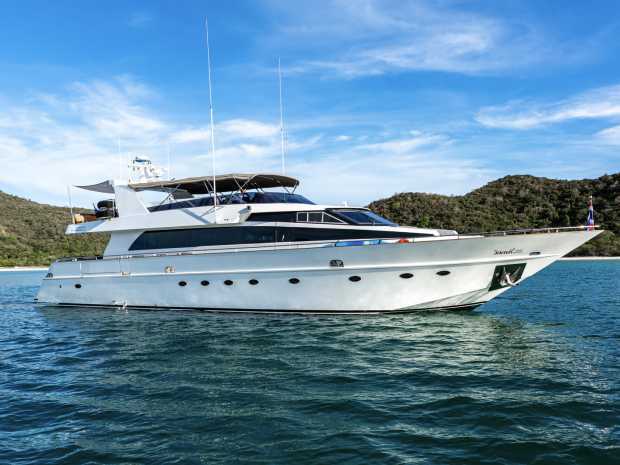 This lovely yacht boasts four spacious double cabins and a large galley for the true liveaboard experience with friends and family. 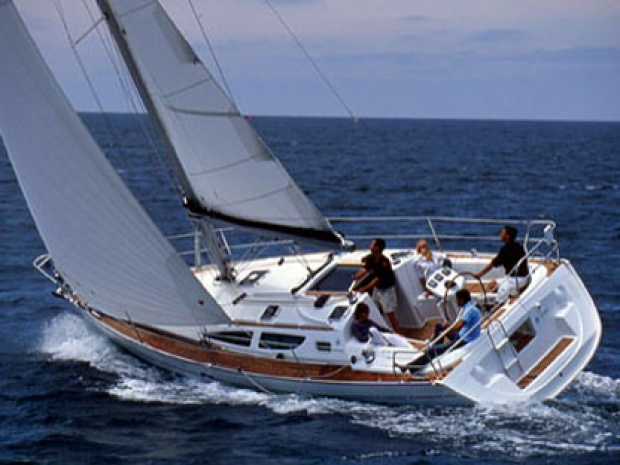 For day sailing or corporate team building, The ‘Beneteau 46’ is in a class of its own with easy to handle furling sails, a light helm and an all-round pleasant sail. 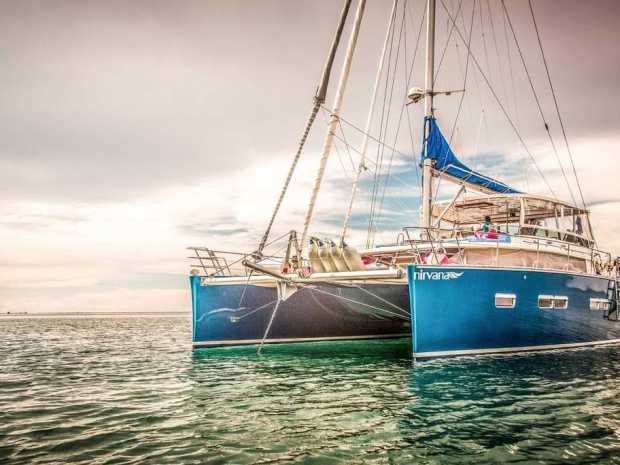 This fantastic sailing yacht has all the snorkeling and fishing gear to complement a days sailing getting you where you need to go and return. 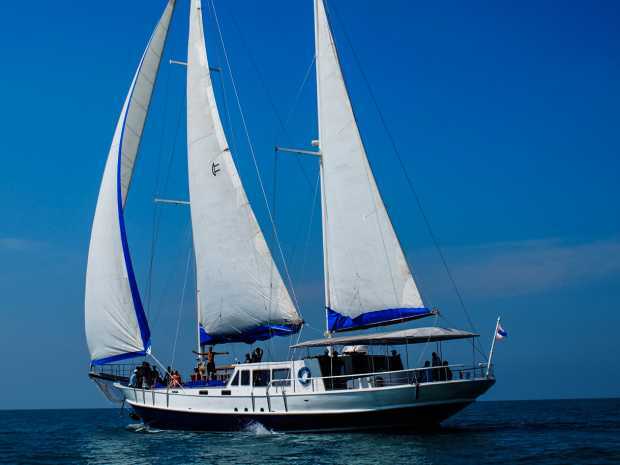 Pattaya Yacht Charters will show you some of the most beautiful islands in and around the Pattaya archipelago and doing it in style on this beautiful 46 foot sailing yacht leaving you with a memorable experience for many years to come. This yacht has remarkable sea qualities and the great Italian name Nauta Design, a benchmark in the superyacht world is associated with its design. 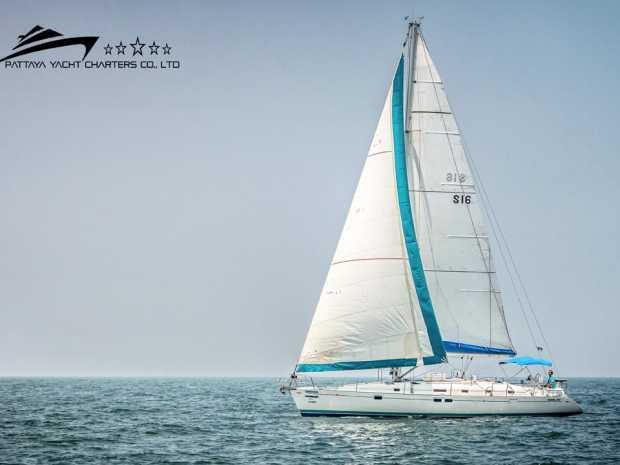 This prestigious yacht has competed in many sailing regattas and has a reputation for outstanding performance and is the perfect vehicle for team building exercises and cruising the pristine waters of the Pattaya archipelago and beyond in comfort and style. She has all the navigation gear and a large tender which will comfortably carry everybody to shore. 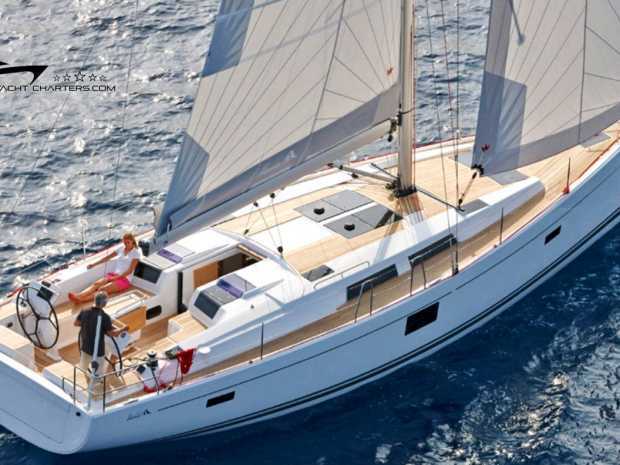 Pattaya Yacht Charters are very proud to bring you this absolutely superb sailing yacht, the newly designed ‘Hanse 455’. This beautiful sailing yacht has a striking and distinctive look and with all the newest technology and innovations, the new Hanse 455 breaks all boundaries of safe and convenient sailing combined with the luxury and excitement of modern fast sailboats. The performance on the water is exceptional and the design and construction quality is unsurpassed. The yacht is also characterised by extraordinary equipment and quality materials which guarantee a grand appearance typical of the vessels that emerge from the Hanse boatyard. The ‘Hanse 455’ is at the forefront of modern sailing yacht construction, with cutting edge, strongly build, easily sailed short handed and a head turner wherever it is seen. The decks are spacious and luxurious with teak wood throughout. The deck is a continuation of the latest models incorporating a sleeker deck profile, a larger cockpit and brilliant storage solutions. Large hull windows and multiple deck hatches make the interior superbly light, removing the feeling of being sat below. The owners cabin is simply unrivalled at 45ft, with a large island bed, completely separate shower cubicle and plenty of storage. This ‘Hanse 455’ was built in 2015 and entered the water in 2016 and really does look absolutely brand new. No expense has been spared keeping this fantastic yacht in perfect condition, you can be sure that the boat will leave your guests very impressed indeed. This fantastic Sailing yacht boast some rather unique cooking facilities and plenty of room for dining with your guests. The ‘Hanse 455’ is also available for overnight charter at a very reasonable price, so you don’t have to rush back to the marina at sunset, you can enjoy the picturesque surroundings under the stars, whilst enjoying our fine cuisine from our expert caterers. As with all of our charter boats, the ‘Hanse 455’ comes complete with it’s own experienced skipper and crew, who will attend to your every need and steer you in safety and confidence to ensure your luxury yacht charter is a truly memorable experience. 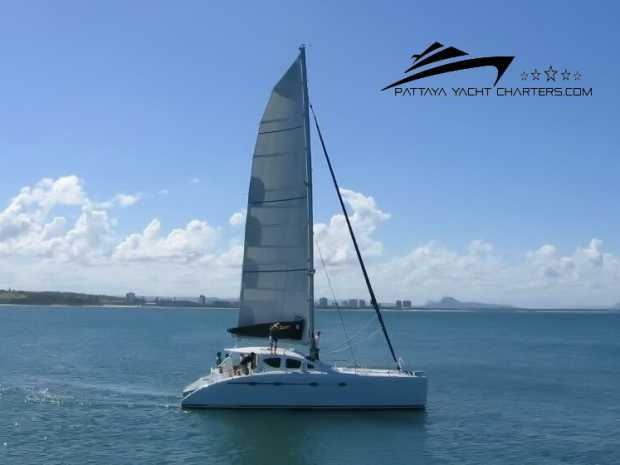 Pattaya Yacht Charters are proud to present this absolutely stunning catamaran. 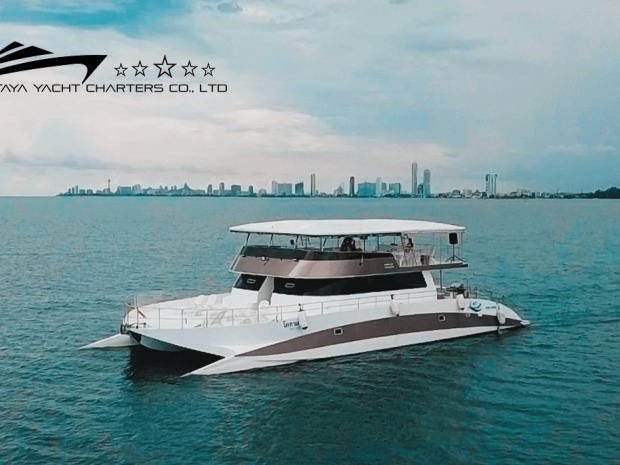 With strikingly modern design and construction, this magnificent vessel certainly stands out from the crowd, the catamaran was built in Thailand and was completed earlier this year to a very fine standard. The yacht has very large decks and is perfect for large groups, for wedding parties or conferences etc. 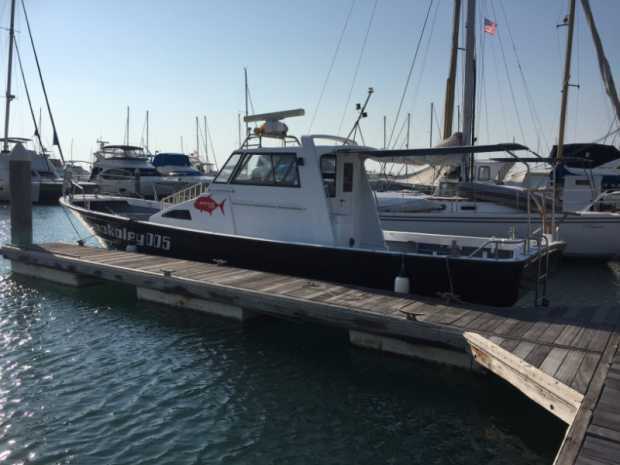 The deck space has all the room you need to entertain your guests in comfort, with seating and tables that can accommodate very large capacity charters. 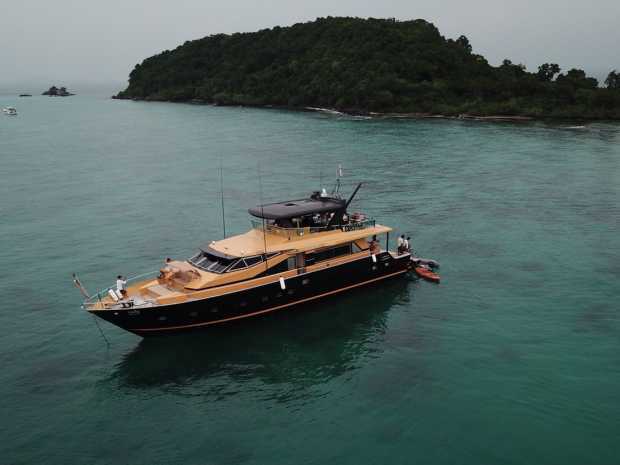 The flybridge is simply huge and has to be the largest catamaran flybridge we have seen in Thailand. There is no shortage of comfortable seating and with large tables for dining, you can enjoy the ultimate sunset dining experience, bringing you spectacular views of the Pattaya archipelago as you wine and dine in style. If it’s a party atmosphere that you are looking for, the catamaran has a fantastic disco light and sound system for you to dance along to. When you embark onto the catamaran you instantly feel a sense of elegance and exclusivity and the stability on the seas is simply breathtaking, due to the sheer size and impressive hull design, the catamaran glides through the waves with ease, leaving you to enjoy your charter experience with confidence and safety. Our professional crew and hostesses will attend to your every need and our optional onboard gourmet chefs will have everything under control on the barbeque, leaving you to enjoy the tranquility and spectacular island views. The yacht comes complete with 2 kayaks for if you would prefer to get a little closer to the water and also we have optional ‘top of the range’ supercharged jet skis available to rent with your charter too, and with complimentary use of fishing and snorkeling equipment, there will be no shortage of fun activities for you to do, adding the extra touch to that perfect day on the ocean. 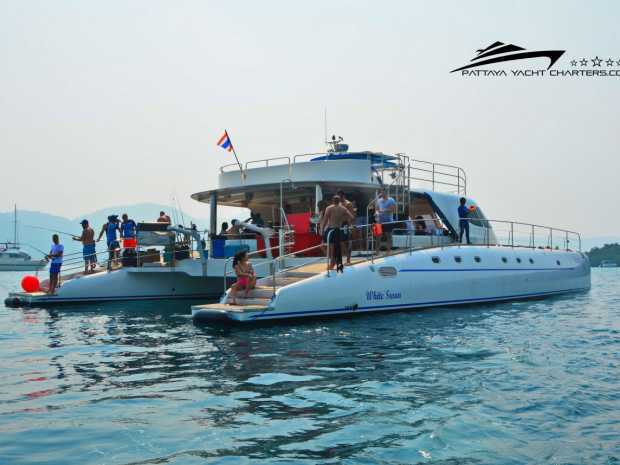 With Pattaya Yacht Charters’ experienced crews and caterers and along with this ultra modern and capable catamaran, you can be sure that you and your guests will be left with a lasting impression of quality and luxury and a fantastic private charter experience. 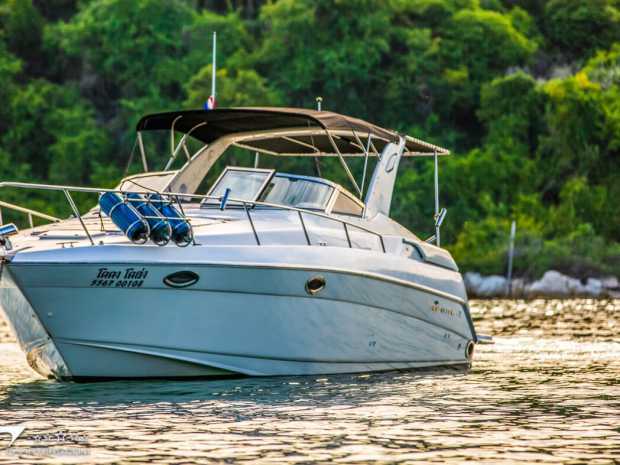 the ’Serinite 52’ is ideal for groups of upto 20 passengers for a day charter cruising around the Pattaya Archipelago, where you can enjoy deserted beaches, fun fishing and snorkelling, along with our optional Jet Ski for some extra exhilaration. 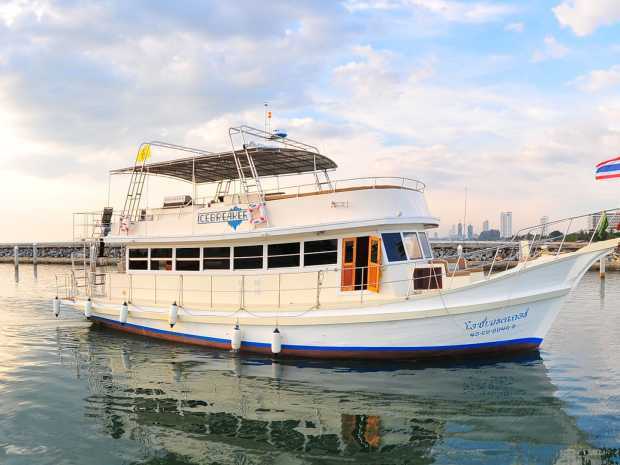 The Ice Breaker has been specifically designed to be the most stylish and comfortable Party Boat that Pattaya City has to offer. With an incredible sound system and luxurious seating arrangements this slow and steady vessel makes for an absolutely awesome Party Boat! The on-board BBQ is gigantic, and with a good sized kitchen area you are certain to enjoy a food feast at your party. There is also a teak wood dance-floor with disco lighting and an incredible sound system for when your party really starts to rock! Even with 40 passengers there is no feeling of being cramped with her being 60 feet in length and seriously wide with an 18 foot beam. To the untrained eye she may not look so spectacular from the outside however she is super comfy and super luxurious inside. The upper deck offers 360 degrees view and there is always a nice windy breeze up there that keeps you cool as you relax aboard. The Icebreaker is by far the best party boat in Pattaya Thailand where no expense has been spared for her stylish interior finish. The time and money that has been spent transforming what was once a fishing boat is phenomenal. The Icebreaker is the perfect vessel for all sorts of parties and corporate events. 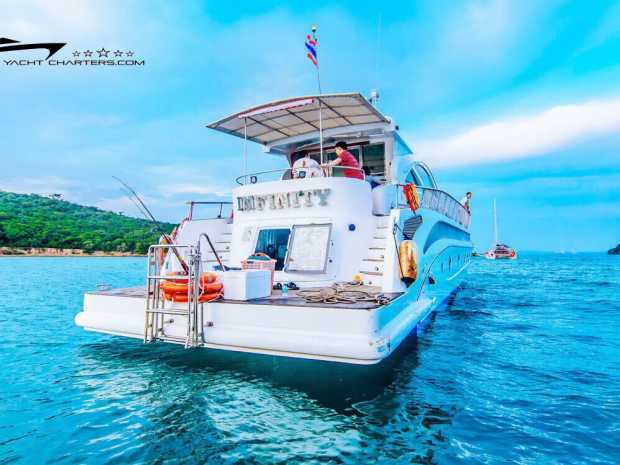 The Icebreaker is such a spectacular, popular and unique party Yacht that we have dedicated an entire website specifically to her at www.PartyBoatPattaya.com. 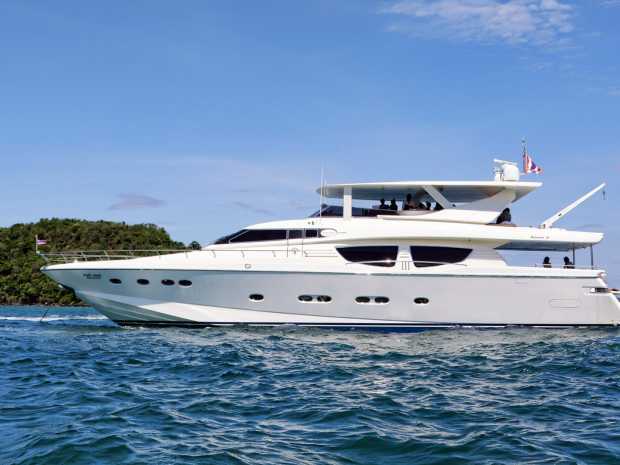 Pattaya Yacht Charters are proud to introduce to you the Baglietto 85 called M/Y Victory as the classiest and most refined luxury Superyacht in our entire fleet. Finished to match world-class standard she is built by the world renowned Italian Superyacht Baglietto shipyard M/Y Victory is an absolute dream to enjoy a luxury private charter upon. 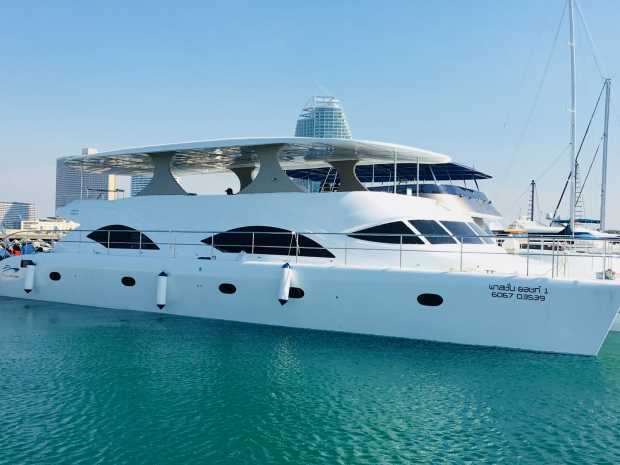 M/Y Victory is a fantastic vessel for a luxury day charter with your loved one, for small groups of friends and families and can she can also cater for parties of up to 30 guests. 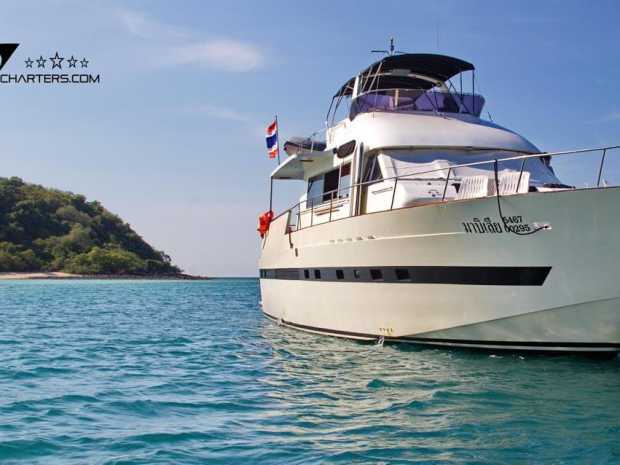 With 4 luxury guest Cabins reminiscent of a classy 5-star hotel with separate Crew quarters she is ideal for spectacular week-long charters to Koh Chang, Koh Kood, and Koh Mak. The difference is this 5-star hotel will be floating upon crystal clear warm tropical bays abundant with vibrant marine life. The entire main deck and huge flybridge is covered in gorgeous teak wood which not only looks great but feels great to walk upon with plenty of natural grip. The lower deck features two Master VIP double bed staterooms and two twin cabins with clean, fresh and modern decor and all with ensuite bathrooms. At the lower decks bow you have the crew quarters and at the aft, there is an immaculate gigantic engine room that houses a full professional workshop, a huge array of tools and equipment including a large reserve deep freezer, washing machines and dryers, watersport toys and a large portable BBQ. The Main deck features a spacious saloon with a super comfy large sofa, built-in TV and an incredible sound system that supplies music to everywhere on the yacht including the aft, the flybridge, and the Bow sundeck. At the Aft of the main deck, there is an alfresco dining area with seating for six. Moving forward we have a large kitchen with all modern equipment and the interior drive station with the top of the range navigation equipment. At the main deck’s Bow, we have a spectacular oversized sun bed where you can catch the suns’ rays in style and feel like a king. M/Y Victory’s upper deck is truly awesome and probably the best flybridge layout of any luxury yacht for charter in Thailand. There is an alfresco dining area for 16 persons with super comfortable seating, built-in bar with fridges and a huge sunbed area that can be with or without shade with the retractable sunbrella awning. On the upper deck, you will also find the main drive station where the expert Captain pilots the ship from. With 360 degrees views and the warm tropical breeze, it is no surprise that the flybridge is usually the favorite place where guests like to relax and unwind during their charter. Whatever your charter duration and aspirations are M/Y Victory will fulfill them all and do it in style! We look forward to welcoming you aboard for you to see why M/Y Victory is the most exciting and stylish contemporary luxury yacht in our entire fleet! Cachee is a magnificent 110 foot Superyacht built by Broward Marine INC USA. She is equal parts classic sophistication and powerful modern superyacht, with a sleek profile and plush interiors. As soon as you are welcomed on board ‘Cachee’ by our professional and highly experienced crew, you enter a world of unbridled luxury. This huge Superyacht is capable of entertaining large groups of upto 40 guests for exciting day trips and smaller groups upto 12 on an unforgettable overnight or multi day exotic charter. This ‘Broward 110’ has a large range of sophisticated and luxurious entertainment areas and she is equipped to be able to handle many days on the high seas. Her spacious main saloon is fitted with stately home furniture and a large 50 inch flat screen TV with karaoke system. The elegant dining room is designed with privacy in mind, making it suitable for business meetings and corporate charters. The alfresco aft deck dining area is very spacious, guaranteed to make every cruise a relaxing, fun and memorable experience. The huge top deck is fitted with oversize inbuilt sun loungers and sofas, cooler fridge, bar and BBQ making for a perfect open air party area with stunning 360 degree views. On board toys include two jet skis, banana boat, kayaks and a powerful speedboat tender and of course snorkeling and fishing equipment. To complete the picture, the ‘Broward 110’ boast four ‘five star’ equipped staterooms, all with ensuite bathrooms to ensure total privacy and relaxation. The staterooms all have fitted closets and large flat screen TV's. The master bedroom is fitted to an incredibly high standard with an en suite bathroom fit for a king. 24 karat gold plated fittings lavish the taps and faucets and the master suite also comes complete with his and hers toilets, showers and basins complete the deal. The Broward 110’s two colossal 1,800 HP ‘Detroit’ engines are a sight to see, gleaming from top to bottom with not even the slightest smell of diesel fuel. 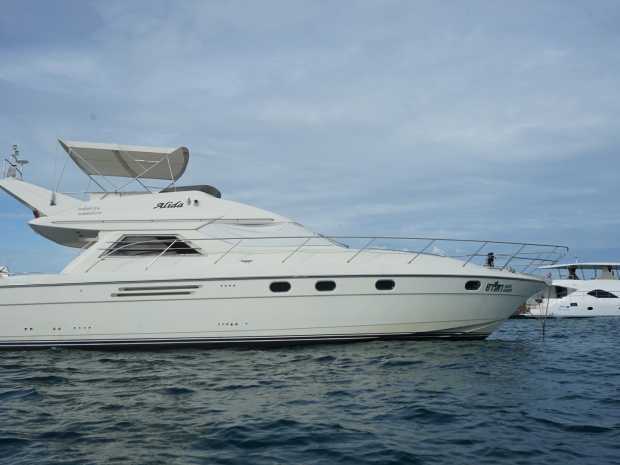 With the ‘Broward 110’ you get absolute luxury, classic styling and comfort at an extremely reasonable charter price. There is truly no better deal in Thailand for a fantastic day on the ocean, with first class catering and all the options that you would expect on a superyacht of this magnitude. With optional extras including professional photography and videography services, massage staff and international DJ’s, the fun never ends and the catering services we offer are second to none, we can even provide on board chefs to cook for our VIP guests while you enjoy the ocean. 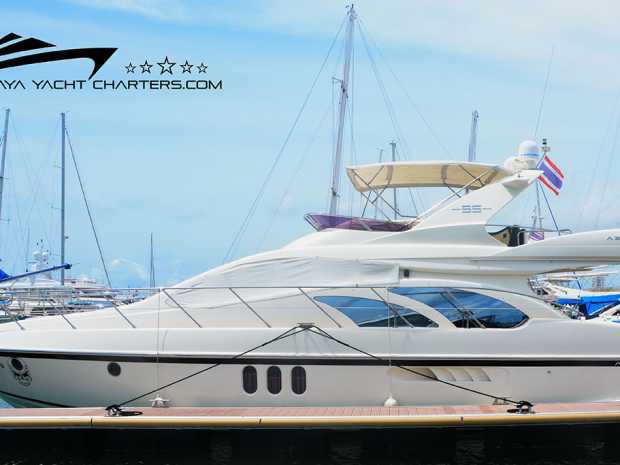 At Pattaya Yacht Charters you are guaranteed to have the charter experience of a lifetime. 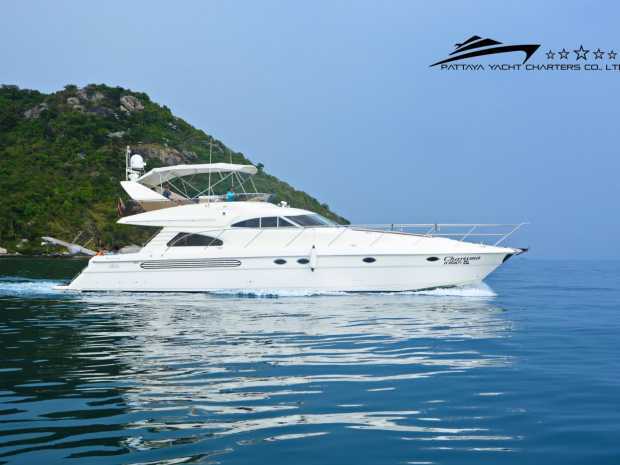 Pattaya Yacht Charters are proud to be the official Pattaya Yacht Charter agent representing this super luxurious, super VIP, SuperYacht, available for charter right here at Ocean Marina Yacht club Pattaya, Thailand. The spectacular 41 meter Ocean Emerald is completely different to any other superyacht found in the Gulf of Thailand and Asia as a whole. In fact there were only three of these magnificent SuperYachts ever designed by naval architect Norman Foster and built by the renowned Italian shipyard Rodriquez Yachts in 2009. The uniqueness of the shape and style of this extremely comfortable yacht is a total privilege to experience for anyone who sets foot on-board. Ocean Emerald was conceived for smooth yachting, elegant living and modern comfort. She is immaculately maintained and always looks brand new and simply stunning. The ‘Rodriguez 135’ is the perfect platform for entertaining friends and guests, an adventure family vacation, a romantic getaway, parties and corporate events. This superb vessel has a choice of outdoor deck areas for lounging and relaxation. Enjoy a dip in the upper deck Jacuzzi or chill out with a refreshing cocktail on one of the comfortable sunloungers. The ‘Rodriguez 135’ features an armada of toys, tenders, jet skis, kayaks and sports equipment, and is an ideal yacht for those looking for a fun fueled charter. 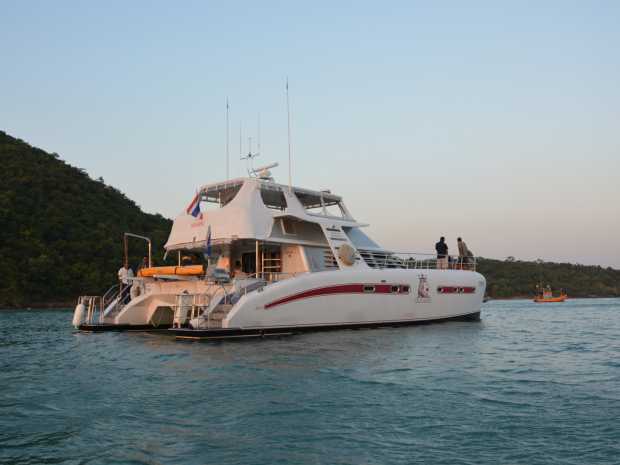 She is simply the perfect vessel to explore the magical waters of the Pattaya Archipelago. 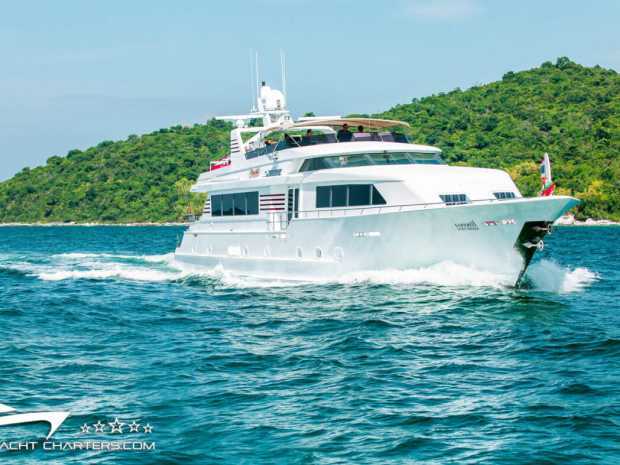 Comfortably accommodating up to 60 people on a day charter, 120 at a dockside corporate event and with sit down gourmet dining available for 34 guests, She comes with all the modern conveniences that you would expect from a newly built superyacht. For overnight charters the ‘Rodriguez 135’ sleeps 12 guests in 5 state rooms with one master suite, 2 double bed VIP staterooms and two twin cabins with Pullman beds. All cabins have ensuite bathrooms. A state-of-the-art kitchen and fitness area complete the guest facilities. Enjoy spacious, comfortable living quarters with great views. The master suite is the ultimate indulgence. A full beam residence with king-size bed, 60 inch TV, ocean-view sofas, ensuite bathroom and two private terraces. Additionally, the yacht accommodates 9 crew to ensure a relaxed, safe, luxury experience. The ‘Rodriguez 135’ boasts a variety of drinks and dining locations both indoor and al fresco in order to dine in supreme comfort with fabulous vistas. Hospitality is highly personalized and everything is tailored to suit your needs. Our talented chefs can prepare a wide range of menu selections to fit all palates and dietary requirements. The yacht’s elegant interior has a contemporary feel, technologically advanced and timeless. 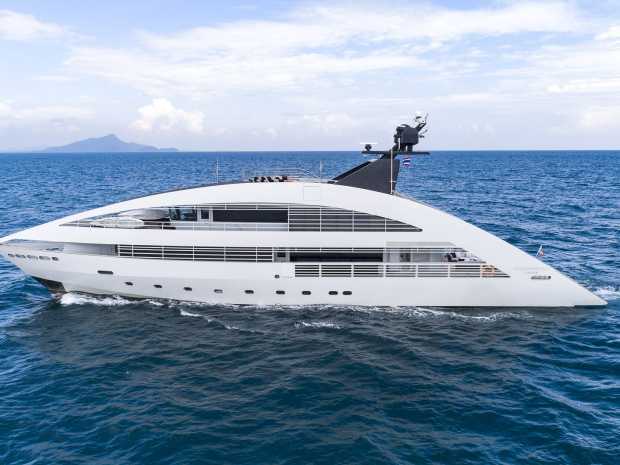 With an outdoors exterior being more than 30% larger than any other superyacht in its class. Remarkable lighting features help set the mood from bright and sunny to a sultry lounge bar feel in seconds. Two stylish saloons offer ample space for indoor relaxation and entertainment. The main deck saloon’s floor-to-ceiling panoramic windows provide an abundance of light and unobstructed views. The upper deck saloon is a less formal area and boasts a library of over 300 of the latest films on a huge widescreen TV. The top deck features a bar, more al fresco dining options, a jacuzzi surrounded by a huge flat sofa area offering amazing 360 degree views from a height equivalent to a five storey building. The ‘Rodriguez 135’ is not limited to just Pattaya’s archipelago and you can experience a magical journey to the best yachting destination South-East Asia has to offer.Relax on the sundeck near Koh Samui making quick trips to the plethora of nearby idyllic islands. Alternatively venture north towards the spectacular Halong Bay or even journey to Hong Kong. Indulge in a smooth cruise across South-East Asia, whether you’d like to visit the Andaman or the South China Sea, there’s enormous potential for exploration. From the beaches of Phuket, past the modern Singapore to the wildlife of the Gulf of Thailand, you’re able to plan a route that fits you perfectly. 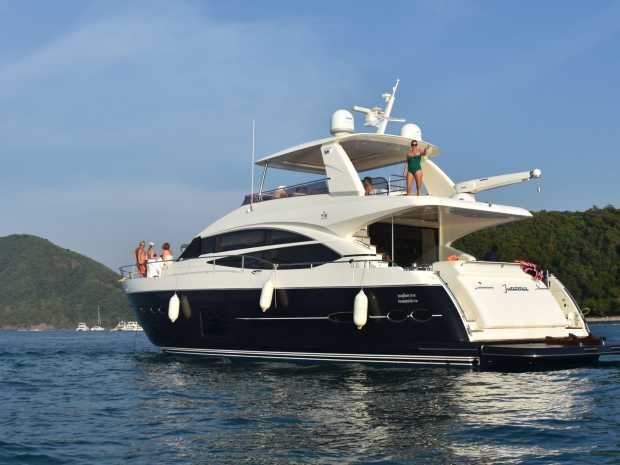 So go on and spoil yourself, indulge your dreams and book a charter upon this wonderful Italian built superyacht and allow Pattaya Yacht Charters Co.,ltd take care of your every desire. 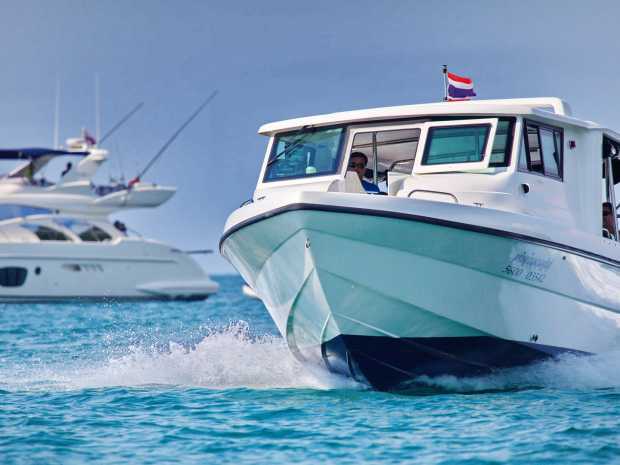 The ‘Albatross 89’ was built here in Pattaya in 2012 by the SEAT Boat Company - Thailands leading boat manufacturer. She was the largest super yacht ever to be built here in Thailand. With no expense spared during construction she is finished to the highest of standards and the interior completed by a well renowned Italian design house. This incredible stylish yacht is available for up to 16 VIP passengers on a day charter while sleeping 6 in the 3 superbly decorated cabins that come complete with their own bathrooms and the latest in home entertainment. The large and well laid salon comes with plush carpets, and over-sized, comfortable sofas where you can sit back completely relax while enjoying the amazing home theater system on offer. Alternatively just chill out, enjoy a refreshing drink and set the stunning 5 colour LED system to fit your mood. Up on the fly bridge you'll find it a great place to sit back and enjoy the stunning views your journey will present you while enjoying some background music from the outdoor speakers. For the sun worshippers there are large sun loungers situated towards the bow and at the aft you enjoy the spacious deck plus swim platform making access to and from the tropical waters easy. Should sitting back and taking it easy not be your style you will find plenty to do as she comes equipped with a jet tender, water skis, wakeboard, inflatables toys along with kayaks. In addition there is also fishing and snorkeling equipment available for use. 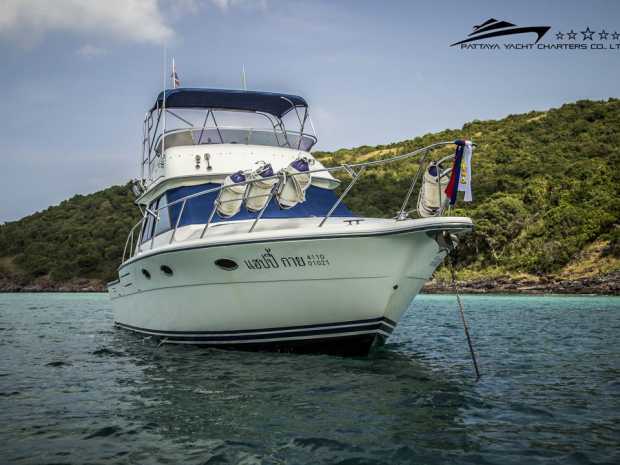 If you wish to cruise the beautiful waters of the Pattaya Archipelago or further afield in complete style and luxury then the ‘Albatross 89’ is the vessel for you. Relaxing aboard this unique Thai super yacht you will surely appreciate all that she has to offer.